A very lucky bowl indeed! 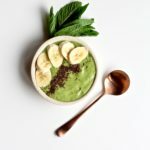 Try this Shamrock Smoothie Bowl and feel as lucky as a leprechaun! Place all the ingredients in a blender in the order listed. Blend until smooth. For a super cold version, add a few ice cubes. Pour into a small bowl and garnish with your favorite toppings!